The new section in our neighborhood has finally opened up. We’re happy to have a new route to walk every evening. Since the builder has not put in any drivable roads yet, this new section is perfectly safe for the kids. They can run wild in there while we quickly snap a few photos for the blog during our walk. I personally think piles of dirt in the background are somewhat edgy lol. Although, the husband thinks otherwise. Full disclosure: I wore this outfit during our walk minus the shoes. No way I am walking the unpaved roads in these heels. While I love finding the perfect spot for blog photos, it’s unrealistic for me. Sometimes, I just have to make the best of the situation even if it means posing in front of a field of dirt lol. I loved when my development was still under construction...there were so many more fun places for photos! You look gorgeous, I love the print of your top! 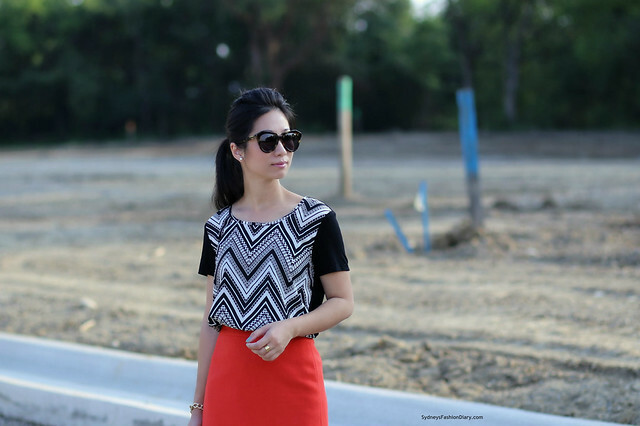 Black/white/red is one of my favorite outfit combos and this one is no exception! Red on B&W is always a winning ensemble......love this one Sydney!!! These models are so beautiful,and these dresses also very beautiful. I love the black and white and red colour combination. The pattern on your top is so different and the black and white goes so well with the red. I like how you stick to neutral shoe. Fabulous color combo! Love your hair, too! Love the outfit, thanks for your sharing. Personally i am also love http://www.anasdress.co.uk/black-cocktail-dresses.html.